The Learning Commons is a welcoming place where students can meet with a tutor, study group, or instructor. The Learning Commons is equipped with state-of-the-art computer technology available for your use. Is the Learning Commons the same as the RRCC Library? 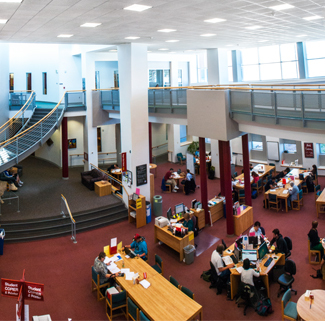 Though we are housed in the same building area, and we often collaborate with one another, the Learning Commons is not to be confused with the Marvin Buckels (Campus) Library which is located on the second floor. Both the Learning Commons and Library are located at the east end of the Lakewood Campus. See our services below. *NOTE: The Learning Commons will be relocating to the Community Room temporarily (Room W 0650) and will be renamed the "Tutoring Area". The "Tutoring Area" will be in the Community Room from May 15th, 2019 - December 2019, while the New Learning Commons space is under construction. All tutoring currently received in the Learning Commons will resume in the Community Room. However, due to the relocation, computer and copy services will not be available. We apologize for any inconvenience this may cause. Computer access will still be available at the Library and Student Project Center, while copy services will still be provided at the Student Life Desk. Other programs or services listed below may have new locations as well and we will be providing those details as soon as possible. Provides advocacy, assessment, direction, learning skills, and school-to-employment transitioning for people with disabilities (including learning disabled). Visit the Career Success Center to learn about yourself, explore career options, and research occupational information through exploration; learn how to gain more experience through experiential learning; and tap into employment search skills through employment services. The College Prep Zone offers tutoring for students taking college prep classes. If you are taking CCR 092 or 094, or MAT 050, 055, or 107, this is the place for you. Located in the library in room 2264, the Communication Lab is designed to tutor students across the curriculum in all stages of oral presentations. All the computers in the Learning Commons are open for use to all RRCC students and staff. Offers navigation and success strategies to reach academic, career, and personal goals. Provides college preparatory English classes for international and resident students for whom English is not a primary language. Also provides academic and cultural advising for a diverse student population, and specific immigration advising for International students. Do you need additional help preparing for an academic placement test? The Learning Collaborative can help increase confidence and skill in math, reading and writing. Located in room 1258, TRiO provides services to participants that will guide and assist in completing their academic goals. Walk-in tutoring in math, writing, sciences, accounting, and other courses is free for Red Rocks students.